This 1800 square foot two-bedroom, two bath condominiums at this luxury Costa Rica resort are located in the perfect spot. In the front, and within easy walking distance, is the beautiful beach of Playa Azul (Blue Beach), which is named after the unique cobalt sand found there . Verdant green rainforests surround the resort which is nestled in a tropical forest valley. Each group of condominiums has a pool or visit the neighboring Azul Ocean Club, for a much larger pool and 5 star and poolside dining, full service and swim up bars, full spa and salon services, fitness center and much more. A two minute walk from your condo. 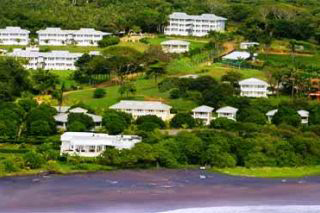 Ocean front resort, 3 pools, 2 restaurants, black sand beach. Retreat from the hectic pace. You've found The Sanctuary Resort. You'll find a peaceful, quiet place where you walk along a secluded beach isolated from others. Sit in the sand and watch the waves crash into the shore or take a dip into the clear, blue, warm Pacific Ocean's waters. Listen to the Howler monkeys move through the trees as you sip hand-pressed Costa Rican coffee on the porch of the open-air, Blue Dolphin Restaurant. Your journey to The Sanctuary Resort is worth it. Sport-Fishing for Blue Marlin gave you the once-in-a-lifetime experience you'll never forget. The Tuna you caught will be served for dinner. Tomorrow's daytrip to the hot springs and rainforest complete with a tree-top tour is going to be thrilling. At the end of the day, relax on the terrace of your condominium, or walk the peaceful grounds of the well manicured resort. 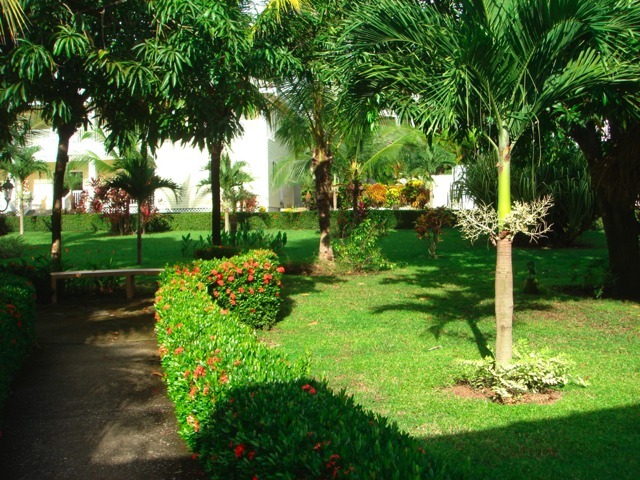 The Sanctuary Condominiums are just a 90 minute drive from Liberia International Airport (LIR) or 4 hours from San Jose. International Airport (SJO). The tourist area of Tamarindo is 1 hour to the north. The city of Santa Cruz is a 30 min. drive to the north. The small local town of Marbella is 5 minutes to the north. San Juanillo (10 min. ), Ostional (15 min. ), and Nosara (30 min.) are all a short drive to the south. The small towns of Marbella and San Juanillo are only a short distance away. In each there are restaurants and mini-markets.